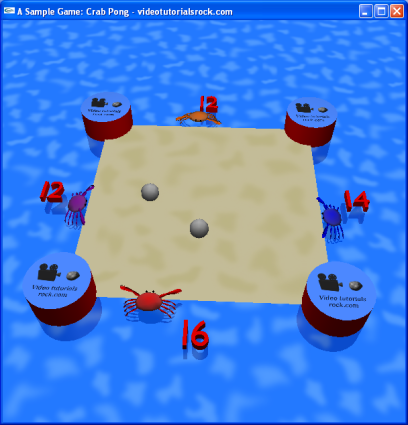 This lesson covers a sample 3D game, Crab Pong, to give a feel for how we might use and combine previously covered topics in practice. This lesson is in "Part 5: A Sample Game: Crab Pong". Skipping around? That's okay. Just make sure you know the material from "Lesson 8: Drawing Text", "Lesson 9: Animation", "Lesson 10: Collision Detection", "Lesson 14: Drawing Reflections", "Lesson 16: Backface Culling", "Lesson 17: Display Lists", "Lesson 18: Normalizing Normals", and "Lesson 20: Materials".